This was only a matter of time. Apparently, the Adderall is kicking in and Trump went bonkers when Bernie Sanders was cheered on Fox News, of all places, when he spoke in favor of Medicare for All. So, here’s the retaliation from the Child in Chief. Is Trump predicting the imminent demise of Messrs. Sanders and Biden? Or stating an intent to slay them himself? He’s clearly trying to sound like the Marshall waiting for the gunslinger to show up at noon on Main Street, but he doesn’t sound powerful, merely stupid. The reaction was what you would expect. And what is with Fox News, indeed? What was with Brutus, when he showed up on the steps of the capital when his buddy Julius Caesar was taking a stroll that day? Cast your mind back to the mystery meeting that none other than Mitch McConnell and Rupert Murdoch had in McConnell’s senate chambers several months back, after hours. Makes you wonder what was discussed, doesn’t it? My prediction? Both McConnell and Murdoch will still be standing, when they can’t use Trump anymore for their purposes. I don’t know when it will be, but I’m quite sure that it is what will be, when the time is right. Maybe Trump is already getting a clue about his impending irrelevance. 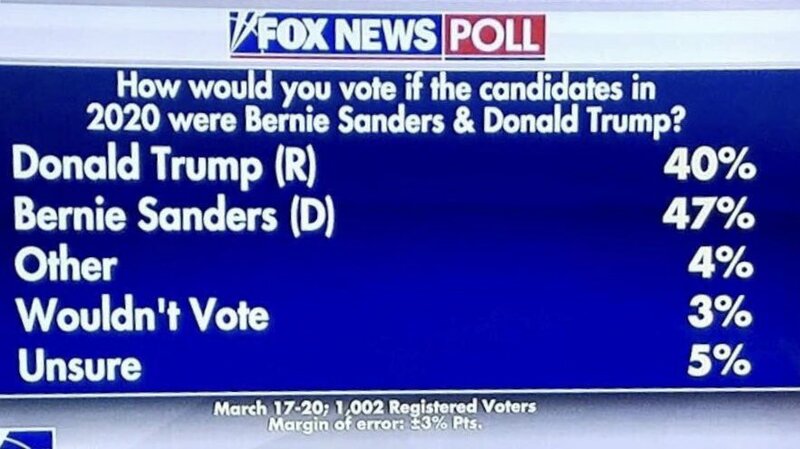 3 Comments on "Trump Asks After Bernie’s Cheered By Fox Audience ‘What’s Wrong With Fox News?’"
I just wish the media would ignore this jackal, then he could go have a coronary cuz he wouldn’t be getting his ‘high’ of attention. Only he’d probably do something horribly ungodly even for him just to get the spotlight back on himself. OMG, pull the ripcord I’m bailing out! LW.. Ive noticed the last couple of days, you seemed to have come to the end of your rope, when it comes to the human shitstain ! What a great read Ursula Faw . Well written and enjoyed by this reader.